The power of styling is now in your hands. BluePen can be easily installed even on a dynamic website. Once you have installed it, you can make your style sheet modifications anytime, anywhere. Everything you modify will be updated real-time in your browser (but not on the live website yet). The modifications will be published right after you’ve pressed the ‘Save’ button. 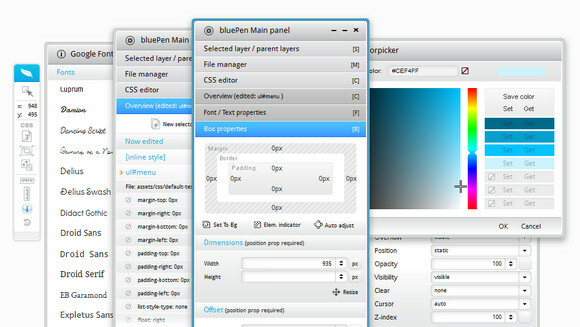 If an element is selected, BluePen offers you a selector with the highest specificity value possible. You can edit this selector, or create a completely new one. It doesn’t matter which type your website is. If it runs on PHP, uses external CSS files and you have file access, bluePen should handle it. So it can be based on Drupal, Joomla, WordPress, Magento or pretty much any CMS system in the world. Seems like an amazing tool but for some reason I havent been able to get it to work and Ive reached out to support multiple times and havent heard anything can some one help me??? It’s not a VISUAL CSS editor. It’s a CSS editor that lets you enter parameters and see a preview. A truly visual CSS editor would allow you to draw items on a canvas and the CSS would be automatically generated. VERY difficult for end user. I would like to allow him to edit only basic fonts, colors. Not ALL my theme styles.